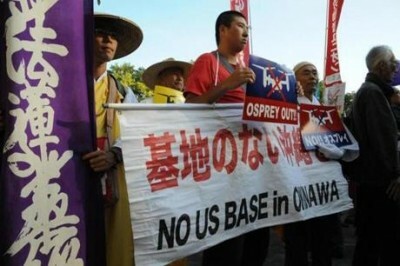 The activists shouted slogans, such as: “Oppose enhanced Japan-US defense ties”, “Bring back an Okinawa without US bases”, “The United States has to respect Okinawa people’s will”. “The government says we are to blame that the issue has stalled for 19 years and they tell us to find an alternative place (for the base). That’s outrageous,” he shouted into the crowd of protesters.